Let's kick off July with a yummy treat. You with me? As a mama I am always in need of caffeine and an afternoon pick-me-up. 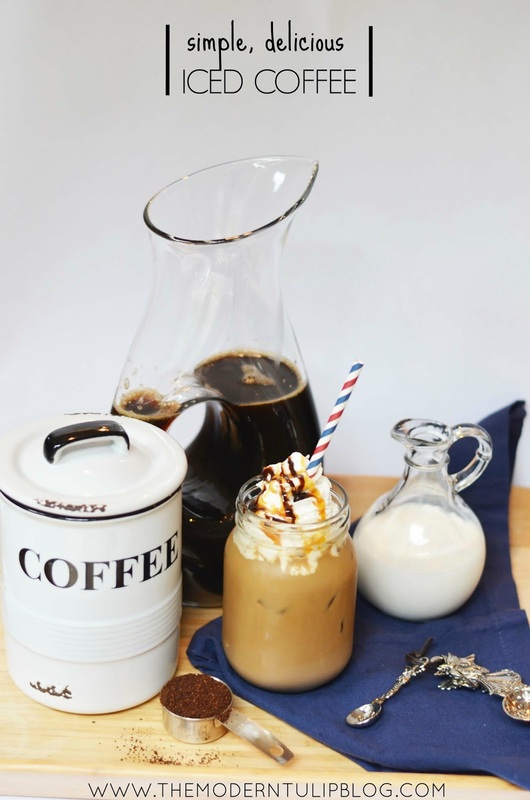 I don't always want a soda so iced coffee has been a yummy alternative and a staple in my refrigerator this Summer. It took a couple of times for me to get it just right, but I have finally perfected my beverage of choice and I'm going to share it with you today so you can enjoy a glass on your back patio or poolside this Summer! Because I am drinking it almost every day I like to brew one big pot of coffee at the beginning of the week. I brew it, let it cool down in the pot and then pour it into my pitcher and leave it in the fridge for easy grabs all week long. I'm sure you already know this, but brewing it and pouring it hot over ice just ruins your beverage and makes your iced coffee a watery mess. So planning ahead makes it simple and delicious! 2 tsp agave - this is key! Top with all your goodies, I like to go fancy! Chocolate, caramel, whipped cream... the works! The agave is seriously the key here people. I swear by it. I've tried Stevia and other artificial sweeteners... seriously nothing better than agave. Which, I also love on many other treats like on toast with peanut butter. But that's a whole different ball game. Simple, refreshing and way cheaper than Starbucks. Cheers, friends! 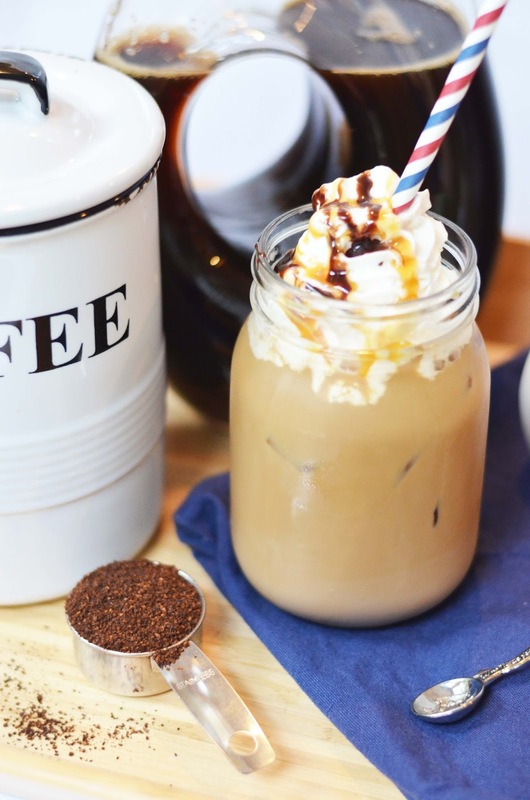 13 comments on "Perfect Iced Coffee "
That looks AMAZING! I'm definitely going to try this myself! YUM! 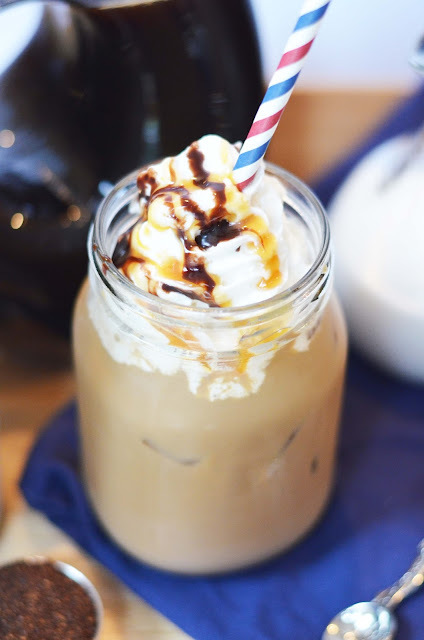 Nothing is more delicious to me in the summer than iced coffee! I just finished my morning cup of coffee and am already drooling over this, haha!! LOVE me some iced coffee! This sounds so good!!!! Especially using the creamer and agave to sweeten it! I love iced coffee! Yum! My mouth is watering just looking at this. I think I've found my new summer indulgence - thanks for sharing, girlfriend! Oh, YUM! This sounds amazing. And way cheaper than Starbucks every morning!